Sara Goldfarb (Ellen Burstyn) is an older woman who is obsessed by television, in particular the strange game show starring Tappy Tibbons (Christopher McDonald). When she receives a letter advising she is going to be on television, she becomes obsessed with losing weight to fit into a dress, to extreme measures. Meanwhile, her son, Harry (Jared Leto), his mate Tyrone (Marlon Wayans) and his girlfriend, Marion (Jennifer Connelly) are having a ball, experimenting with drugs and dabbling in selling. Things are ace; then things go bad. This is very close to being a sadtacular film. Close, but watching it again, the impact was greatly lessened. It is still an extremely good film, well crafted, stunning, amazing soundtrack, marvellous performances. But it no longer holds the power to cause me to cry my eyes out. If you’ve been scared to watch it, don’t. It’s worth it, even if it is hard. 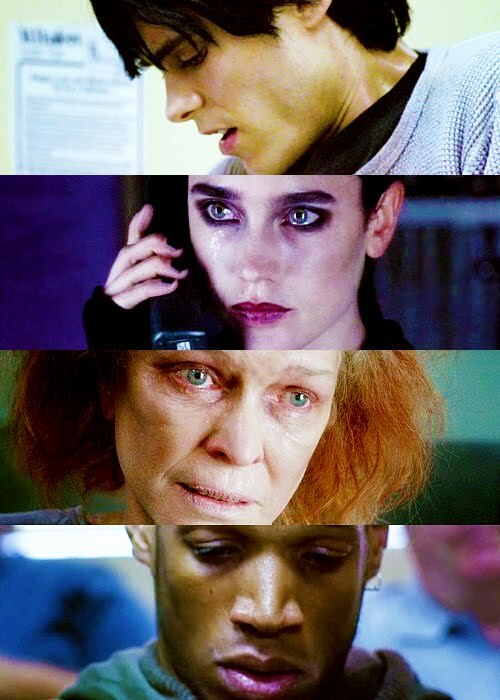 Requiem for a Dream was nominated for an Oscar for Best Actress in a leading Role (Ellen Burstyn).